Looking for an appetizer to wow your guests this holiday season? 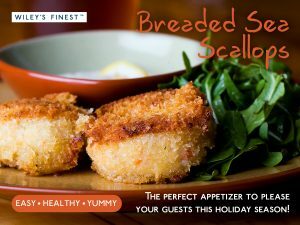 Try these delicious Breaded Sea Scallops. • In a shallow bowl, lightly beat egg. In another bowl, toss potato flakes and bread crumbs with salt and pepper. In a third bowl, toss scallops with flour to coat lightly. Dip in egg, then in potato mixture, patting to adhere. • In a large skillet, heat butter and oil over medium heat. Add scallops; cook until golden brown and scallops are firm and opaque, 2-3 minutes per side.